How can mediation keep your family and your business together? Oliver Hallam is an accredited mediator and solicitor who works nationwide and covers a wide range of civil and commercial disputes. Running a family business can put a real strain on family relations and it is not unusual for conflict to set in. This is no surprise because family businesses face a unique challenge – balancing the competing interests of the business owners, the family and the trading business. Family business mediation can keep your family and your business together because it is a confidential, cost-effective and flexible process that engages all the family and enables them to create their own solution to their issues. Would you prefer to create your own solution for your family or leave it to the court to impose its solution on you? Mediation lets you stay in control. Have a look at the ‘three circles’ diagram above. Each person, numbered 1 to 7, has a different relationship with the business. You will be able to put each of your family members into one of the seven categories and despite your shared DNA, you will see how everyone’s interests differ. The challenge of balancing these competing interests increases in times of change. What do I mean by times of change? It could be the transfer of the business to the next generation or it could be a divorce in the family, a death, a sibling rivalry, an unforeseen external market event. These events are not unusual. They are inevitable. However, research shows that families are often ill-prepared for these eventualities. Have you planned who will take over the management of your business? Do you know how shares can be transferred? 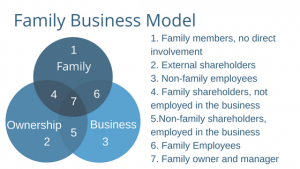 Have you considered adopting formal business and family governance practices? Has the senior generation made a plan for retirement to give subsequent generations in the business some certainty about what will happen in the future? It is not unusual for the answer to these types of question to be no. They are difficult issues to address and family dynamics can make these conversations seem impossible. It never seems to be the right time to discuss the bigger picture. But if you do not have the difficult conversations, tensions will inevitably rise and if allowed to escalate, family unity and the survival of the business can be threatened. No business family wants their family to fall into the trap of ‘rags to riches and back again’. How would most family businesses want to resolve their differences? In my experience, they want to resolve issues between themselves, out of the public eye and at limited cost. Families want a solution to reflect the way they live and work. Every family is unique and so a solution cannot be off the shelf. It needs to be tailored to fit the family. Family business mediation is confidential. These are private issues which go to the heart of how the family defines itself. The last thing a family wants is to see its private affairs dragged all the way to court through a costly, divisive legal process and then spread far and wide through the national and social media. At mediation, everyone agrees to be bound by the same confidentiality agreement. It is cheaper than litigation and is a process which allows business owners to create their own solutions to their issues. It will take less management time out of the business than litigation. It is a process run by an accredited mediator who is sensitive to the potentially fragile family dynamics but is determined and energetic in ensuring the most difficult issues are addressed. If an existing professional adviser helps the family in these circumstances, they may feel uneasy about helping the entire family because of their professional duties and conflicts of interest. If they have always been Dad’s solicitor, accountant or land agent, there may be a perception, however unfair, that they are ‘on Dad’s side’. By contrast, a mediator is neutral and can work with all members of the family and their existing professional advisers to help the family make a plan for the future. The mediator’s fees are usually fixed and are divided equally so that there can be no arguments that the mediator is on Dad’s payroll. Mediation is far cheaper than fighting a dispute through the courts. The mediator will speak to all members of the family in confidence to ensure that their voices are heard. The mediator will facilitate discussions between different members of the family to see if issues can be resolved. Families learn a huge amount by stepping away from their workplace to consider the future of the family and the business. It is easy to recommend legal and accounting solutions for a business family but these governance structures do not mean anything unless the family buys into them. Done well, family governance prevents conflict. Why? Because the family has an agreed plan for most eventualities. Done badly, the family is bound by a set of documents it does not understand or believe in. Family business mediation allows a family to resolve conflict and make their own plan for the future. Many families wish they had started the process years ago.